Seattle / Tacoma Kimono Club: So You Want to Make a Kimono? Hello, reader. If you're interested in kimono or yukata - maybe for cosplay, maybe for a summer festival, or maybe even for just slobbing around the house - you're in the right place. This (monstrous) tutorial covers everything from purchasing cloth to finishing a girl's or woman's unlined kimono or yukata. When I first started to become interested in kimono, it was a little intimidating because all of the kimono for sale seemed to be for girls much smaller than I am. For reference, I'm about 5 foot 9.5 inches, or 176 cm, tall in my bare feet, slouching. I'm losing weight (slowly) but right now I also wear an American size 14 to 16 in women's sizing. I am not a small girl, so having a hobby that is geared towards tiny Japanese girls is difficult. I got so frustrated with wanting to wear pretty kimono but not being able to find any in the right size that I started researching their construction. Most of the commercially-available patterns like Simplicity's costumes are nowhere near accurate. (The one exception might be Folkwear's kimono pattern, but I haven't tried it myself). My method, while not perfectly traditional and exactly "right," is good enough that I've stood in front of professional dressers and not had them notice that my kimono isn't "authentic." Now that it's summer, I've had more time to work on sewing. For me, this means I'm either making costumes or kimono! I took some pictures of the last kimono I made so that others can see the process. I do all of my measurements in centimeters, so if you're not familiar with the metric system, keep a calculator nearby - 2.54 cm to the inch. Traditionally, a bolt of Japanese cloth for kimono is woven at around 34-38 cm wide and 11+ meters long. This has a few implications: one, the bolt is cut very little and most of the sewing is selvage edge to selvage edge; two, several pieces are needed to wrap around the body properly. However, unless you happen to live in Japan or can get very inexpensive shipping, a bolt of the cheapest cotton yukata fabric or wool kimono fabric will cost much more than going to your local fabric store and picking out a nice fabric for $5 a yard. Given that, I'm assuming that you're going to pop over to a fabric store. I personally do most of my shopping for kimono stuff at my local Joann's, because I take the 40% off coupons they have in their weekly circular and the 40% off coupons from Michael's - Joann's accepts both their coupons and their "competitors." Saving 40% on fabric means that I can get nicer cloth on a student's budget. Anything shiny, glittery, slippery, or "silky" will be difficult to sew and look less authentic. This includes most of the "formal" fabrics, a good portion of the apparel fabrics, and most of the brocades; brocade is used in kimono, but the fabric store's will almost always be Chinese-style brocade. If you use this, your kimono won't look authentic. If that's the look you're going for - a less traditional, "modern" kimono, go for it, but be aware that people may assume you don't know what you're doing. If you're going for "casual" - a simple cotton komon or yukata - the quilting section may be your best bet. Many of the quilting cottons are great patterns that will make really nice kimono. The linen and wool "suiting" section will also have some nice cloth that work really well for plainer, muted kimono. Avoid stretchy fabrics! Anything that distorts because of the fabric's thread content or weave will hang strangely and not look right. Test the fabric by pulling on it to see if it will stretch. Spend some time on the above forums, or Ichiroya, a kimono shop, looking at authentic kimono to get a feel for what looks right. Now that you've got a fabric that looks like a good candidate, how much should you buy? As you can see, the sleeves have a dangling part called "furi." The length of the sleeves varies according to age and formality, but we won't be getting into that here. For almost every modern woman's kimono, a sleeve length of 50 to 60 cm will be perfect. If you need longer sleeves, just alter the amount you need. With 114 cm or "standard" 45 inch cloth, a girl my height can plan to use about 5.25 yards; I usually buy extra so I can make cute accessories and have a little leeway. For reference on how this is laid out, see the cutting diagram below. Find a large space - I use my basement floor - and spread out your fabric. There's a lot of it. I need a lot of fabric to wrap around my wide hips and to accommodate my large wingspan (139 cm wrist-to-wrist), so I cut out several strips at 38 cm. This website has some good instructions on how to make yukata. I find it a little confusing, personally, but it's a great resource, especially for figuring out how large your pieces should be. Cut two panels of this size. Mine, as you can see, are 350 cm by 38 cm. 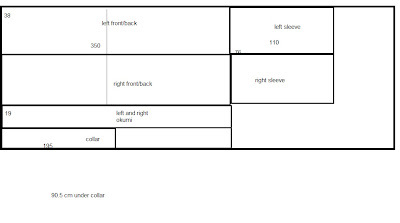 The lighter line on the diagram shows the halfway point; on the finished garment, this will be at the shoulders. There is no seam or cutting here, just the bolded lines. Cut another strip that's 350 cm by 19 cm. This will become your front okumi panels when you cut it in half to make two 175 by 19 cm strips..
Cut a strip for the collar. 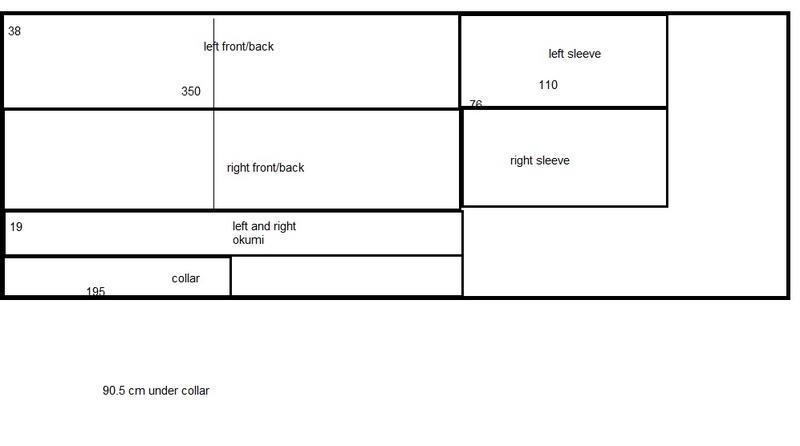 On standard fabric, making a bachi or half-width collar will be easiest: 19cm by 190-200 cm. Making a full-width collar requires either wider fabric or more standard-width fabric. The fabric I used for this this kimono was wider, so I had enough to make a full-width collar: 38 cm by 190-200 cm. A "collar cover" is usually on kimono, too. I cheat and just put a little pleat in the collar panel, eliminating the need for a second piece of fabric. Cut two panels 38 cm by twice your desired sleeve length. For 50 cm sleeves, 110 cm allows for seams and such. From left: a sleeve panel, folded in half, an okumi, the two body panels, another okumi, the other sleeve. If you "folded" it across that shoulder line, it starts to look more like a kimono! The collar panel isn't pictured here. Now that you have all of your fabric cut out, it's time to deal with the fact that we're not using Japanese cloth. On a kimono bolt, we would just start sewing stuff together; with Western cloth, I prefer to finish the edges so they don't unravel and they look nicer. I run a quick rolled hem around the long sides of the body panels and the okumi panels, leaving the short sides unfinished for the final hem. I also do a rolled hem around all four sides of the two sleeve panels. Sewing kimono is actually pretty simple - at least, the way I do it. I'm sure there's legions of kimono purists out there who would die of shock at the way I do things, but I've found a way that works for me. That seam you just made will run down your back on the finish garment. Next, take your okumi panels and lay one on top of the unsewn front part of the body panels, right-sides-together. Sew a straight seam on the edge closer to the "gap," and repeat on the other side - when you're finished, you should have a long rectangle sewn halfway up the back, and two rectangles that overlap in the front. You can drape this over your shoulders to see how it'll eventually form the wrap for your kimono. Next, deal with your collar. This is probably the most difficult part of the kimono, and should be done patiently; it's also where I diverge the most from "traditional" sewing. In traditional kimono tailoring, the okumi panels aren't cut, just folded up into the collar to give it some extra stiffness and body. I choose to not do this because it gets complex, and I'm lazy. First, figure out how much okumi you need underneath the collar. For me, it's about 90 cm, give or take. Divide your height by 2 to figure this out, or just use a basic 80 cm... This is a variable measure. Lay out your kimono so that the back and front panels are straight and the okumi panels overlap, as you'll be doing this next part one side at a time. Starting at the bottom of your okumi, measure up and mark where your collar will end - for me, 90 cm from the hem. Use a sewing marker, or chalk. I used a chalk pencil for this next part, because the fabric was dark; unfortunately, the photographs didn't turn out - so I made more diagrams. Do this again, mirrored, of course, on the other okumi panel, and you should start to see where the collar will fall. Set aside the two portions of okumi that you cut off - they're not necessary. You get to do the actual collar now. Take your collar portion and fold it in half lengthwise; if you're making a bachi collar, it should now be roughly 9 cm by 200 ish. Fold it in half widthwise, to find the middle, and place a pin on the exact center. Unfold it widthwise, so that you have a very long, narrow strip with a pin in the middle, and place the pin onto the back seam of your kimono. Begin pinning outward, aligning the edges of your collar with the cuts you just made; I usually do all of one side and then all of the other side. If you'd like, put a small pleat about 45 cm from the center on both sides to simulate having a collar-protecting strip of fabric. Drape it over your shoulders to make sure that the collar didn't get misplaced or screwed up, and then sew it on. Carefully follow the line of the collar first with a straight stitch. The long, straight portions are pretty easy, but once you get into the curve, sew very slowly and pay special attention to the body fabric to make sure it doesn't get wrinkled strangely or slip. You need both hands to do this, so I don't have pictures, but I'll try to get some the next time I make something new. Once you have the straight stitch done, drape the kimono over your shoulders to make sure everything got sewn properly. If not, carefully rip it out and start over. Once you have the collar securely sewn on, I run an overcasting stitch along the raw edges to stop it from fraying. If you have a serger, you could use that, or you could fold the raw edges into the collar itself when sewing. Congratulations! Your collar is now sewn on. Breathe a sigh of relief, take a break, and come back when you're ready to do the rest of the kimono. The next step is sewing the side seams. Fold your kimono in half at the shoulders - it should be roughly as tall as you are now - with the right sides together. In order to leave a space under the arms, the arm holes left by the seams are very large. I leave a space of 36 cm unsewn at the shoulders. Measure out the arm holes, pin up the sides, and run a straight stitch down. I place another pin in the armhole itself, to show where the sleeves will be attached. There should be a ~ 15cm gap between the sleeve and the side seam called the miyatsukuchi. To mark this, just measure 21 cm down from the shoulder and place a pin there - but don't sew up to it! Do both of your side seams in this way. You now have a garment that really only needs its sleeves! Take this opportunity to check the fit around your hips. If your hips are small compared to your wingspan or bust, you can adjust that by running a larger seam down the sides to compensate. The edges of your kimono should effectively wrap around you 1.5 times - walk a little to make sure you're comfortable moving in it! Now, make and attach your sleeves. Take the sleeve panels you hemmed earlier and fold them in half to make a less-narrow rectangle, right sides together, and make your sleeves. To do this, pin alongside the short side opposite the fold. This will be the bottom of your sleeves. Next, mark out your sleeve opening. I usually eyeball it by stretching out my hand; it should be about 20 cm. Pin down the long side of your sleeve underneath it. You should now have a "pocket" with an opening in it, formed by the pins on two sides and the fold on a third. Leave the other long side open. Carefully draw out a curve on the sleeve's corner where the two pinned sides meet. Sew along the pinned sides, following the curve, and flip the sleeve right-side-out. You have one sleeve! Repeat with the other sleeve panel, and proceed to the next step. Leaving your kimono inside out and your sleeves right-side-out, place the long open side of your sleeve against the arm hole. This is difficult to take pictures of! Carefully pin your sleeve to the arm hole, leaving that 15 cm gap. Gently pull the sleeve out, turning the kimono right-side-out as you do, and try it on to make sure it looks right. You should have the open length of sleeve closest to your body, forming a "pocket", and a little gap underneath where it attaches, like this. Carefully turn it back to the way it was, and sew the sleeve on. Start at one side of the gap, and sew directly around until you hit the pin marking the start of the underarm gap on the other side. There's a lot of fabric being manipulated here, so take it slow and make sure nothing slides around. Do the same to the other sleeve and the other side, and try on your kimono! Take a second to make sure that everything falls nicely, nothing puckers or pulls, and that your sleeves are nice. Run a thicker rolled hem around the bottom of the kimono to give it some weight, and you're done! Better pictures next time I do this, I promise - the lighting in my basement is terrible on the best of days. If you have any questions, this blog is a great place to start; the Immortal Geisha forums are also an amazing resource. The Knowledge Bank section offers fantastic tutorials on everything you could ever need to know about kimono, ever. I do the collar before side seams because I find it easier to deal with all of the fabric. Out of the kimono I've made, the ones whose collars I sewed first seem to lay more nicely because I'm not working around the side seams, too. So I would say I find it easier, yeah - I hate doing the collar too, so I just get it out of the way! i am a first time kimono maker, any tips or tricks you could share? My biggest tip that I offer people who are beginning is to purchase at least one authentic kimono or yukata so that you can examine the construction and general measurements and proportions as a referance. You can still make a really nice kimono following instructions here, or on the website linked in this tutorial, however it does help to have a physical example to reference, especially for the angle of the collar. Try making your first kimono using cheap fabrics, so that you can get a feel for the construction. It is possible to sew a kimono entirely by machine, however I like to sew the seams by machine, and hand sew the hems and sleeve openings using a slip stitch. Also, the link shared in this tutorial mentions "kise" seams, this means folding the fabric over the stitching on the vertical seams and ironing it flat, so that the stitching is hidden underneath the tiny little fold. Doing kise folds with your seams is very good for having an authentic looking kimono, as it highlights the seams that are important aspects of the kimono's construction, as well as reduces stress on the stitching itself. There are several methods for sewing kimono, so use whatever method you find comfortable doing. I hope that helps! Feel free to ask questions. Also, the Immortal Geisha Forums has a good number of links to other websites, publications, and youtube videos about sewing kimono. I made a kimono for me and my daughter for a party. She knows more about them than I do, so I left the traditional belt part up to her to make. She has been was ting one for a long time and was soooo happy with it! Thank you. This is great! I'm a costume-junkie by passion and by trade, and I was so happy to find your post! I've been looking for clear instructions to make a somewhat traditional looking yukata for a while, and your article answered a lot of my questions! I might write a blog post about it, and if I do I'll definitely link this article in it! Thank you, and cheers! Thank you for posting this tutorial!! It's nice to have some simple instructions. I'm thinking about doing a Haruitsuki cosplay, which requires both a blue inner kimono and a bigger magenta/reddish one with longer sleeves on the outside. It's still going to be a lot of work, but it seems more possible now! Thank you!